Insitu’s ScanEagle small unmanned aerial vehicle will soon have two advancements to improve its performance in the maritime environment and on land – an expeditionary launching system and a new Visual Detection and Ranging (ViDAR) sensor for broad-area maritime surveillance – further opening up the potential vendor base for the Boeing subsidiary. Don Williamson, Insitu’s vice president for the ScanEagle product line, told reporters May 16 at the Navy League’s Sea-Air-Space Exposition 2016 that, whereas traditional electro-optical and infrared (EO/IR) sensors tend to search for items of interest with a “soda straw” aperture, making it very tough to do broad area surveillance, the new ViDAR package can scan 160 degrees and use pixel-to-pixel correlation to determine what is water and what is a non-water. As the camera finds non-water objects of interest, those images are sent to the operator’s screen and can be zoomed in on if the operator wants a better look. The system can see targets 10 miles away and can scan 13,000 square miles of water on a typical ScanEagle mission. Williamson said this is not only useful in maritime surveillance but also for search-and-rescue operations, where quickly locating a person in the water is a matter of life and death. “International navies and the U.S. Navy have expressed tremendous interest in ViDAR. We think it’s a game-changer, as do many of our customers,” he told reporters. 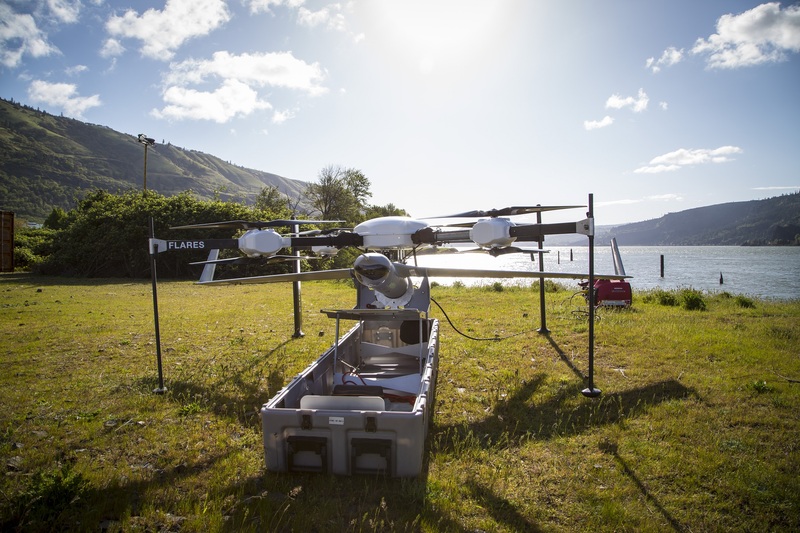 ViDAR, developed with Hood Technologies in Oregon and Sentient Vision Systems in Australia, is part of an exclusive teaming arrangement and will not be available on other small UAVs, Williamson said. The team will continue working on the ViDAR product, hoping to create a camera that can be used in the nighttime to allow for around-the-clock capability. Additionally, Insitu will field a Flying, Launch and Recovery System (FLARES), which is essentially a UAV that launches the ScanEagle UAV. ScanEagle is launched by a catapult and recovered when the vehicle’s wingtip catches a skyhook, and while the system takes up comparatively little space, it is still not conducive to some environments. By connecting the UAV to a rotary-wing UAV, the pair can take off vertically, clear the tree line or buildings, and then separate in flight. Williamson said this duo preserves “the strength of having a long-endurance, high-persistent fixed-wing UAV” while making it even more expeditionary – with the ability to be launched from a jungle, a mountain top, or even an embassy roof. The ScanEagle already comes in a carrying case, and FLARES can disassemble and fit into the same case, so a person in a pickup truck with two cases in the back would be capable of launching a 12-hour intelligence, surveillance and reconnaissance (ISR) tool from almost any location. Williamson told reporters there is “tremendous, tremendous interest in FLARES” – so much so that two customers were identified as “early adopters” and will get to field the system later this year, before Insitu can manufacture enough systems to meet demand. He said those first deliveries should be made by late summer or early fall. The first FLARES systems will only accommodate the smaller ScanEagle system, used by the U.S. Navy and many others, but Williamson told USNI News that the company may later on create a variant to launch the larger RQ-21A Blackjack operated by the U.S. Marine Corps. FLARES returns to its point of launch after separating from the ScanEagle and would wait on the ground while the UAV runs its mission. For recovery, an operator attaches a rope to FLARES, which flies up vertically and simulates a skyhook to catch the ScanEagle – though Williamson said there is more slack in the rope, creating a less forceful landing for the UAV that is easier on the frame. “The first iteration of FLARES will be land-based. We see that FLARES might work in a maritime environment (on small ships and boats), although that gets a little bit dicier,” he said.